One of the to-do's our pediatrician gave us at the girls' 2-year check up was to ween Jenna from her pacifier. Well, we let a month and a half slip by before we actually addressed the issue. I'm such a rule follower so it's quite surprising that I didn't follow the doctor's orders right away, but I was dreading it. Most major changes we have made with the girls actually have gone over pretty smoothly, but I think I was hesitant about this one because it would be something Jenna would have to go through all on her own. 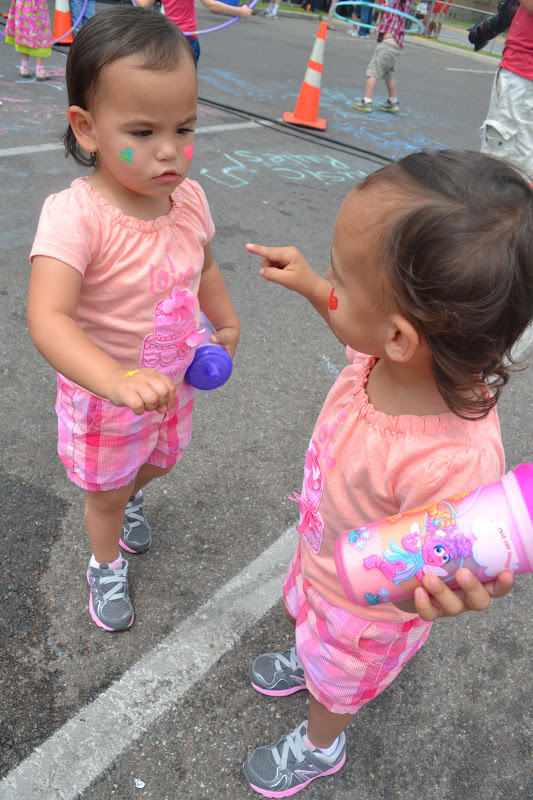 Before the girls were born, I had made the decision that I didn't want them to have pacifiers. I stuck to it with Layla, but Jenna was given one in the NICU and by the time she got home, she was hooked. Once I realized how much better she was sleeping than her sister, I tried to give Layla a paci as well, but she wasn't having any of it. I guess that's what I get for making such a silly decision before even meeting my babies! Anyway, fast-forward two years and we've got one sweet baby who was going to have to go through several nights of agony without her soulmate to feel her pain. I just couldn't stand the thought! One Friday night in early May, Aunt Devin and Cousin Emory were coming over for dinner. 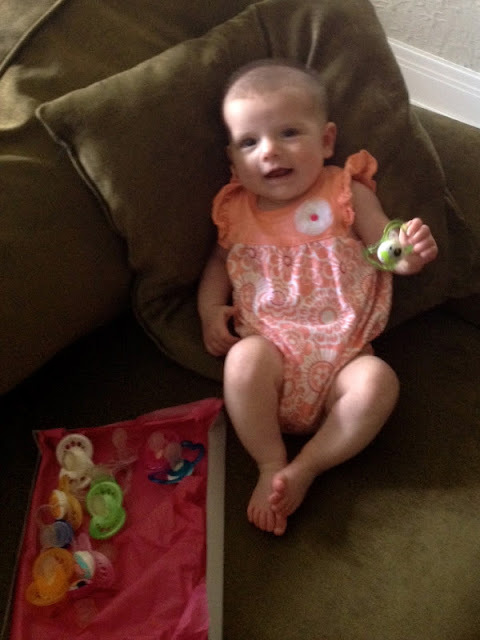 At the time, Emory was almost 3 months old and a perfect candidate for a pacifier! I had been talking with Jenna for several weeks about how she is a big girl and Emory is just a baby and how pacis are for babies, not for big girls. We talked about how it would be really nice to give all of her pacis to Emory. Jenna agreed during our conversations, but when our talks started to get a little serious, she would panic and ask to go to bed (because that is the only place she could have her paci). With Devin and Emory on their way over for dinner, I figured this was our chance. When the girls woke up from nap, I told them we were going to wrap a special present for Emory. They were super excited and Jenna even seemed to be on board when I told her we were going to wrap up her pacis! Jenna: "Okay, I think this is all of them! Wow! I have a lot of pacis! Look how wonderful they look in this box! I just love my pacis! They are so beautiful!" I helped to line them up so we could count them. Unfortunately, we were missing two. Layla: "Oh man, sissy, that is harsh. I'm so sorry." Things got better when it was time to pick out the wrapping paper. Jenna: "The answer is pink. The answer is always pink!" Jenna: "Ooh, pretty! Now let's open it!" No, no Jenna...let's put it aside for Baby Emory. We still had a couple of hours until dinner so I kept reminding her of our plan to gift the pacis to Emory and telling her she was such a big girl. I didn't want her to forget and then completely panic when the time came. She seemed okay with it and excited to give Emory a present. We even celebrated by having 'big girl' cookies for dessert. Jenna: "This cookie is good, but I'm not sure if it's worth it." After dinner and dessert, we gathered in the living room for the gift presentation. Jenna: "Here you go, Baby Emmy!" Jenna: "I'm not sure how I feel about this, but I'll put on a brave face since these people keep calling me a big girl." Jenna: "Mommy, go get it!" Devin later sent us the picture of Baby Emory opening her gift. Overall, Jenna really did great for her first night. She cried for 8 minutes, whimpered for 11 minutes, rolled around and called out for Dr. Jeremy for 5 minutes (she's obsessed with our dear friend, her ENT specialist), and then hung out in her bed for another 45 minutes. Once she fell asleep, she was golden. The next several nights were pretty similar and, to this day, she still takes a long time to fall asleep. She also continues to ask for her paci on most nights, but I think she just wants us to say that she is a big girl. I wouldn't call it a super smooth transition, but it hasn't been horrible. Now, Lord help us if those two missing pacis ever show face around here! The Norman Music Festival set up shop all along the streets of downtown Norman during the last weekend in April. Although we didn't check out all the various stages and musicians, we did take Layla and Jenna to the kiddie area for a little musical fun! 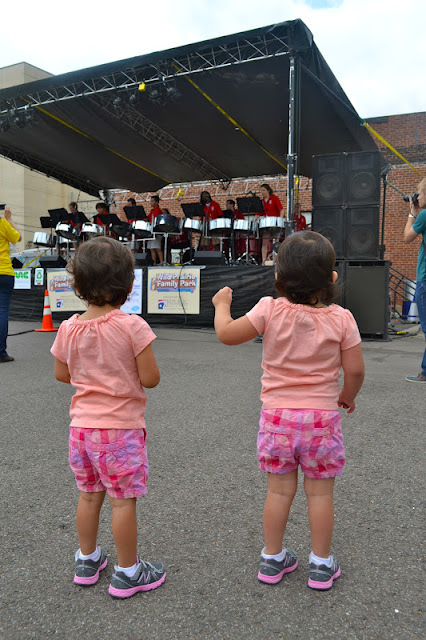 When we first arrived, the OU Steel Drum Band was performing on stage and the girls were definitely intrigued. Jenna: "Snap your fingers to the beat, sissy!" After the OU band, we had some time to kill before the next performance, so we walked around the lot to see what else they had to offer. 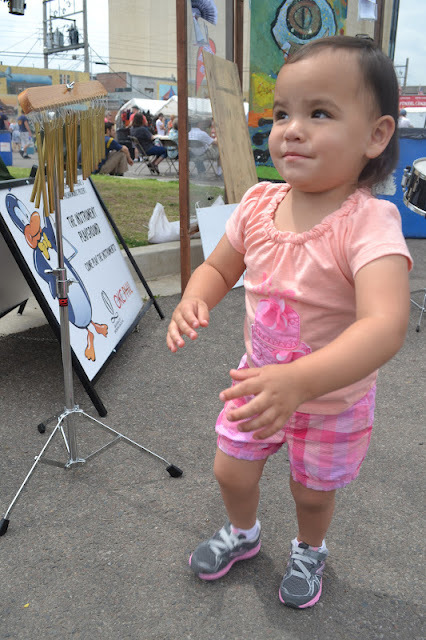 The Oklahoma City Philharmonic and the Oklahoma City Orchestra League provided an instrument playground that was oh so fun! "Man, listen to us! We're awesome at playing the chimes!" Jenna: "All this music we're making makes me wanna dance!" "Can we get one of these at home?" Jenna: "Okay, lady, I know you work here and all, but keep your distance with that tambourine!" Layla: "Hmmm, what shall I play?" Jenna: "Can you name that tune in 3 notes?" "So, we're not really sure why this bunny is here, but, COOL!" Jenna: "Hang on guys, time out for a little chalking!" At the center of it all, we found a face-painting station. Jenna was an old pro since she had done this before at her friend's birthday party. She knew exactly what she wanted. Jenna: "Don't mess this up, lady...I mean business!" Jenna: "Well, what do you think?" Layla was a bit hesitant, so we started with a design on her hand. We eventually went for the face, but she changed her mind half way through! 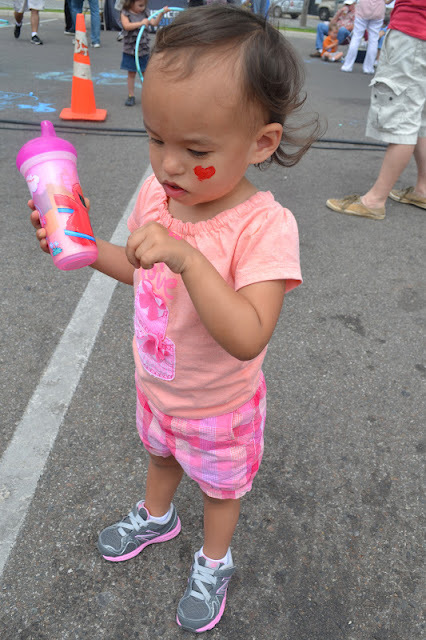 I think we were able to salvage the heart and she seems pretty happy with the hand-painting. Layla: "Um, you've got a little something right there." Taking their seats for the next performance! "Bring on the Sugar-Free Allstars!" Layla: "Hang on, funnel cake break!" Jenna: "That's right, Daddy, shove it in!" ...and Jenna got a little closer look with Mommy. We didn't stay for the whole show because the girls were pretty tuckered out, but we certainly had fun! 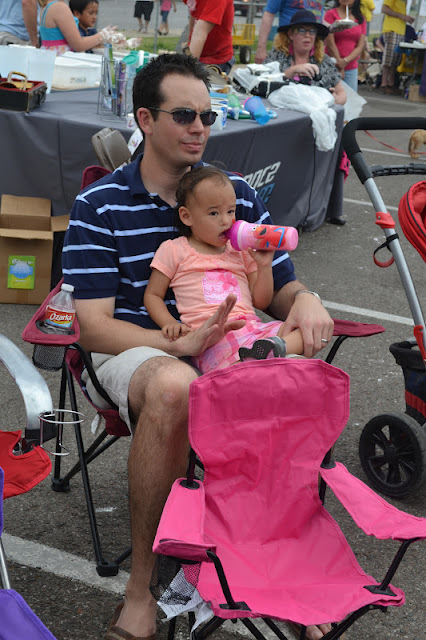 Music, bunnies, face-paint, and funnel cake...what more could a kid want?!?!?! One month ago today, I celebrated my 33rd birthday. Well, to be truthful, I typically celebrate the whole month of April, but the actual day is the 24th. My sweet family said that I could do anything I wanted for my birthday, so I chose the OKC Zoo! Layla and Jenna called in sick to school, Trey took the day off, and we all headed north to see the animals. Quick side story...the pictures from this day were amongst the hundreds of pictures I "lost" a few weeks ago during an upload. I was devastated. Thankfully, my brilliant husband was able to retrieve them from a super secret folder on my Mac and then decode them so that I could access the files. There are still a few pics that I can't get to upload to this post, but don't worry, there are plenty below! 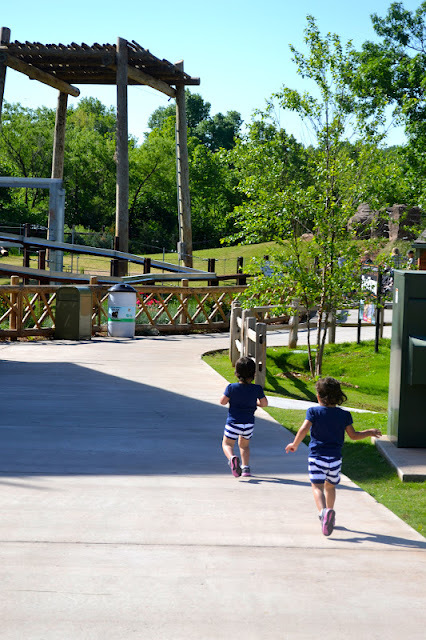 This was only the second trip to the zoo for the girls. They went a year ago and it wasn't a very pleasant experience, so their parents hesitated taking them back. A whole year has passed and I just knew they were ready and would love it! 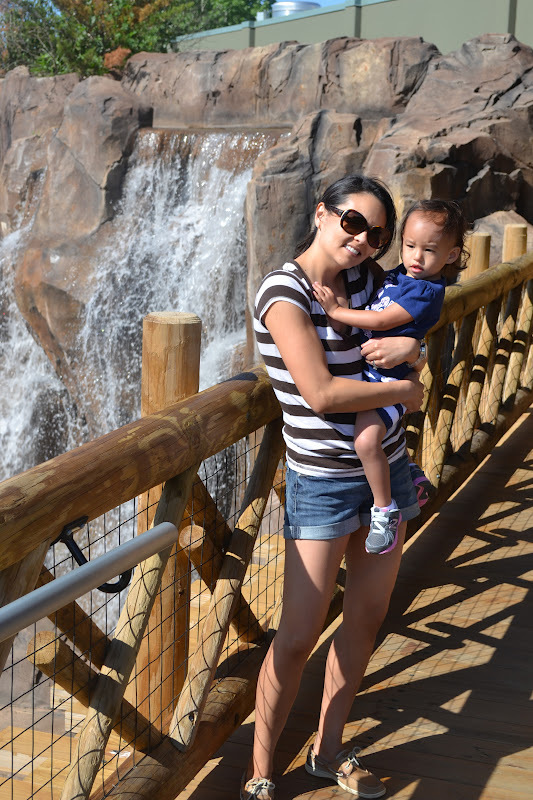 Our first stop was the Children's Zoo. When we entered the petting zoo portion Layla jumped right in. There was a silly goat resting on a bench, so we told Layla to sit next to it. She thought we said to sit ON it, so here she is trying to saddle up! Layla: "Here I come, Mr. Goat." Layla: "Oh! You said sit BY the goat. I get it now!" Jenna was a little more hesitant. She preferred to be inside the barn where the animals were caged. Jenna: "See, sissy, it's much safer in here." Layla: "Oh, come on, sissy. These goats wouldn't hurt a fly. Right, Daddy?" After several stops along the way, we made our trek toward the elephants. 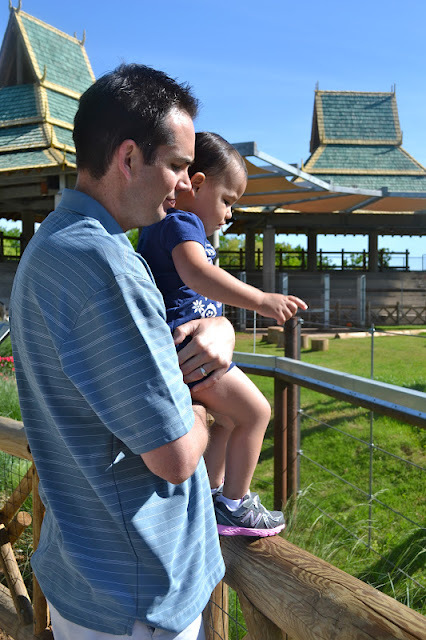 This was our first visit to the new Elephant Habitat and our first time to see Baby Malee who celebrated her first birthday a week or so prior. "We're off to see the elephants!" Jenna: "Ooh, Daddy! They're spectacular!" They certainly are! And, their habitat was just amazing! At the very tiptop was this beautiful waterfall. Layla thought it was the perfect spot to pose with her Mommy. Okay, maybe that was my idea and I forced it on her. After checking out a few more exhibits, we headed toward one of the playgrounds for a picnic lunch. Of course, Layla immediately found the slides...she loves them! And Jenna found this frog! Layla: "Ooh, I wanna go on there!" Jenna: "I ride! I ride!" Yes, of course, we let them ride. Unfortunately, the carousel pictures are the ones I can't seem to upload. I, meaning Trey, will continue working on them and, hopefully, they'll be posted soon! UPDATED (5/25/12): YAY! 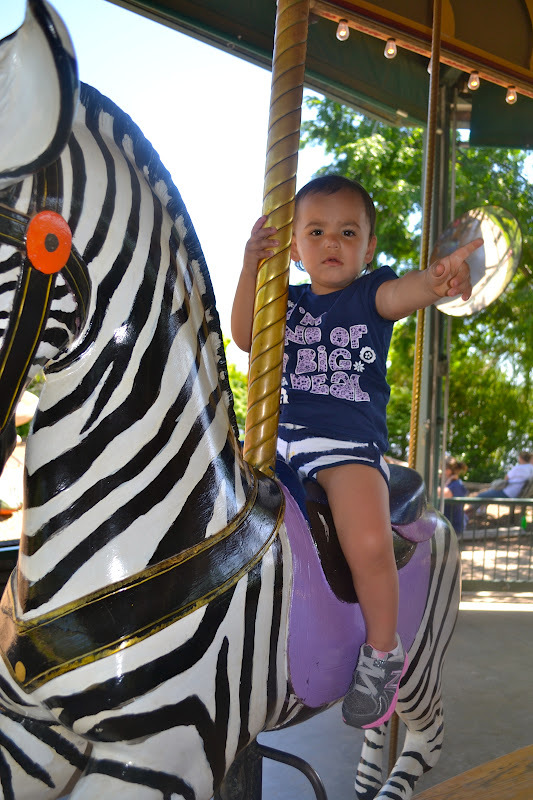 Trey saved the day again...here are those carousel pics! We decided the carousel was a great finale to our trip, but, of course, we couldn't leave without a couple of souvenirs! Okay, I have to include this picture of my turkeys looking at a turkey to tell another side story (how else am I going to remember these things in 20 years?) There is no denying the girls are strikingly different in size. 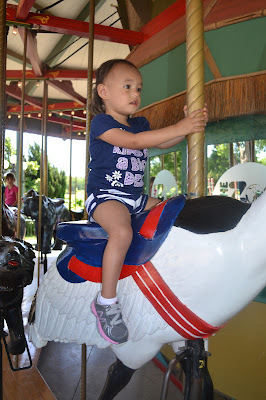 As they were trotting around the zoo I kept thinking to myself, geez, Jenna already needs bigger shorts. 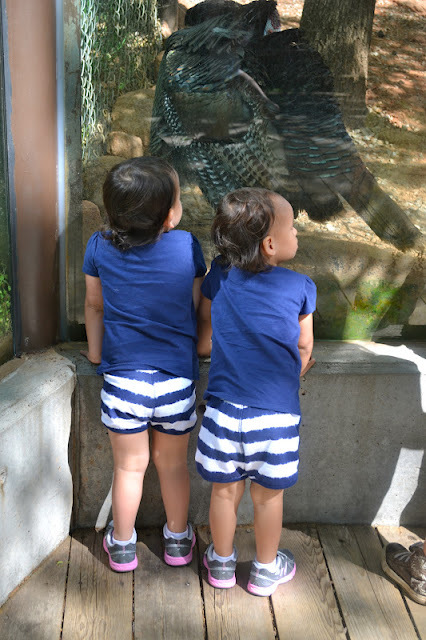 During a diaper change right before going home, I realized their shorts were switched! Poor Jenna was stuffing her 3T body into a 12-18 month pair of shorts! ...and here is Layla looking forward! Those who know me well, know that cookie cake with white icing is my all-time fave! What a perfect way to end a perfect day! Thank you to my sweet family for a wonderful birthday!